Lust or love? Is there a difference? What do dead fish and Greek Gods have in common? 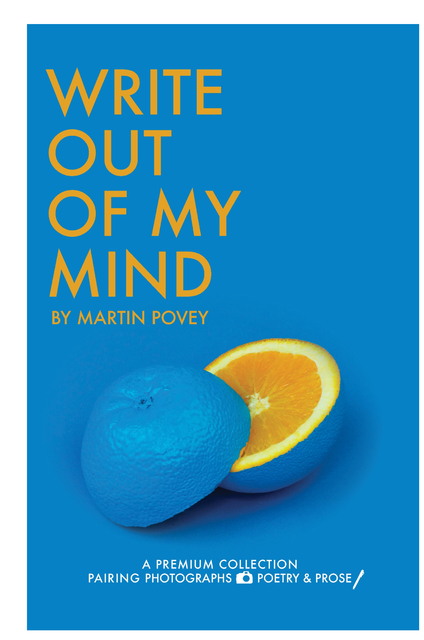 Martin Povey’s Write Out of My Mind is a premium collection of verse and versatile short stories that serves up the answers in this dim sum for the mind. Presented in almost 40 delicious bite-sized treats this compelling collection will tempt every taste. And to satisfy the eyes, each work is accompanied by the photography, along with the thought process, that inspired its writing. Write Out of My Mind is guaranteed to produce a smile, prompt a tear or two and perhaps even change the way you think and feel. Versión ebook de composición fija, 170 págs. As a Writer/Producer and Business Mentor, Martin Povey has written millions of words for hundreds of diverse corporations and clients. He also writes for the sheer joy of writing. Martin’s short stories and poetry have been published in several exclusive anthologies. He is Chair of the City of Medicine Hat’s Arts & Heritage Advisory Board and a Past President of The Medicine Hat Rhyme & Reason Writers’ Club. Martin lives in Medicine Hat, Alberta with his wife Mary Lou.